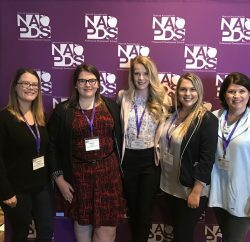 Faculty and students from the College of Education (COE) attended the National Association for Professional Development Schools (NAPDS) conference in Washington, DC on March 9-11. Graduate student Rachel Steinbrenner presented with faculty members Kathleen Tootle, Catherine Howerter, Ph.D., and Lisa Davis. 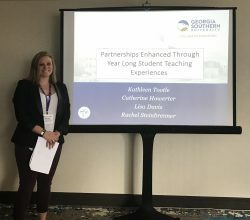 Their session, titled “Partnerships Enhanced Through Yearlong Student Teaching Experience,” detailed the three teacher preparation programs in the College that are implementing yearlong student teaching internships for pre-service teacher candidates. Presenters provided their perspectives of the yearlong internship process and benefits such as closer, proactive relationships between the College and schools as well as a more integrated student teaching experience for the teacher candidate in the school climate. Howerter also co-presented with fellow faculty member Amanda Wall, Ph.D. on a session titled “Learning Together: The Story of a New Faculty in Residence Program.” Pat Parsons, Ed.S., director of field experiences and placement, assisted in developing the presentation. During the session, Howerter and Wall discussed the efforts of the College to develop a Faculty in Residence (FIR) program. FIR allows faculty members from the COE to spend time “in residence” at a partnering P-12 school collaboratively supervising teacher candidates and addressing mutually agreed upon school initiatives based on the school’s strategic plan. Both Howerter and Wall are actively participating in the College’s first pilot of the FIR program this semester. Undergraduate dual certification (special and early childhood education) majors Brittany Harbin, Julia Mobley and Allison Sebler also attended the conference and participated in a poster presentation. Their presentation, “Effects of Pre-Services Teachers Within the Classroom,” included data collected from student teachers in the dual certification program and and clinical supervisors at their field placement to determine the impact of pre-service teacher candidates on a local elementary school. 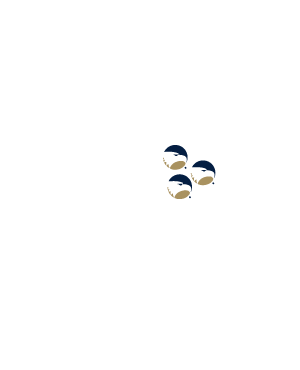 NAPDS serves as an advocate for the educational community in promoting continuous development of collaborative school, higher education and community relationships.